Suffolk County Crime Stoppers and Suffolk County Police Fifth Precinct Crime Section officers are seeking the public’s help to identify and locate four people who stole from three stores last month. Three women and a man stole two pairs of Beats headphones from Best Buy in Patchogue on December 24 at 2 p.m. Approximately one hour later, they stole two more Beats headphones from Verizon Wireless in Patchogue. 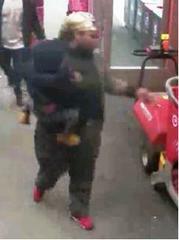 The group then went to Target in Sayville and stole clothing at approximately 4:50 p.m. During the thefts, one woman was pushing a baby stroller and another woman was carrying a male toddler. They may have been using a silver or gray Ford Fusion. Authority: Sgt. Greg Heller CC# 17-743084, et al.